For the person wondering: S was yesterday. 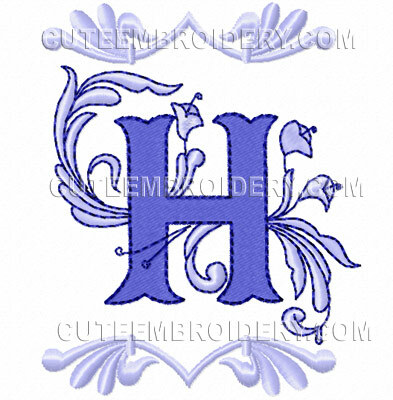 Today is a repeat H.
Hi there, The Bluefont "S" is up for download - but the letter "H" comes up as a download. ?? Is there a problem with the system? We already have the H. No voting????? Try to be patient for the remainder of the Charming Blue font. I am sure it will be added once it has been digitized and test stitched. I am sure she is working as fast as she can to create the beautiful letters we are so used to receiving here. Why is the rest of this Font not up for Vote????? Thank you I am happy with the patterns. Remember if you miss a design -- VOTE for it. All daily free designs are offered because of votes. VOTE each day for the designs you want. All votes are reset daily -- so each design has a chance to be the next free design. I missed b and c of the blue flower letters!! anyone who can help me out? They stitch out beautiful!! thanks! This is a beautiful alphabet - thanks so much! With such beautiful designs,there is no need to edit a to go with design when monogramming.Thank you.